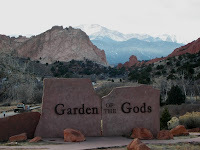 Garden of the Gods is a beautiful 1319 acre park & major tourist attraction here in Colorado Springs. The red rock outcroppings are among the most photographed scenes in Colorado Springs. The site is a National Natural Landmark, recognized by the Department of the Interior as "a nationally-significant natural area." Pikes Peak overlooks the towering sandstone formations. The park was given to the city of Colorado Springs in 1909 by the children of railroad magnate Charles Elliot Perkins, in fulfillment of his wish that it be kept forever open and free to the public. Activities include guided nature walks, hiking, mountain biking and horseback riding trails, road biking and technical rock climbing.